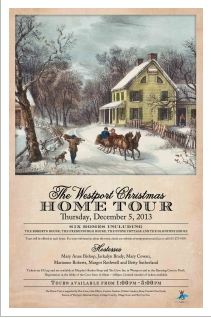 On December 5, 2013 tour some of Westport’s historic homes all decorated for the holiday season. Seats on this tour are limited so reserve yours today. Home to be toured include: The Fredenbourgh house, The Stone Cottage and The Old Stone House. Tickets available from Murphy’s Barbershop, The Cove Inn, and the Running Goat in Perth. Tickets are $15 per person. Registration is in the lobby of the Cove Inn at 11am-1pm. Show up on time to get your seats. I am not sure exactly. I know you were supposed to register at the Westport Town Hall. I bought tickets for the Home Tour in Perth, but there wasn’t a brochure listing the location of the houses on the tour. How do I find out about these?